If you haven't done it yet, do it now! Forgive yourself for all the crazy things you think you've done and let it go. If there is regret in your soul, let it go. Let it go now! We are each on a path that is uniquely our own. No one else can live it. No one else can overcome and move forward as you do under the circumstances that you find yourself in. This is your life. Each choice you make is yours to make and only yours. You will live the consequences and you will reap the blessings. This journey is yours alone to decide to be great or just average. Your potential for greatness is unlimited. The opportunities to learn, grow, and serve the world are as numerous as the sands of the sea. Every day, every person you come in contact with is sent especially to you for some great purpose. This life, this world is not an accident; not some random act of nature but an exact expression of God's greatness. You, me, and everyone in the world was carved in his image and have all of eternity to grow into the divine heritage from which we came. Remember that forever is in every moment. 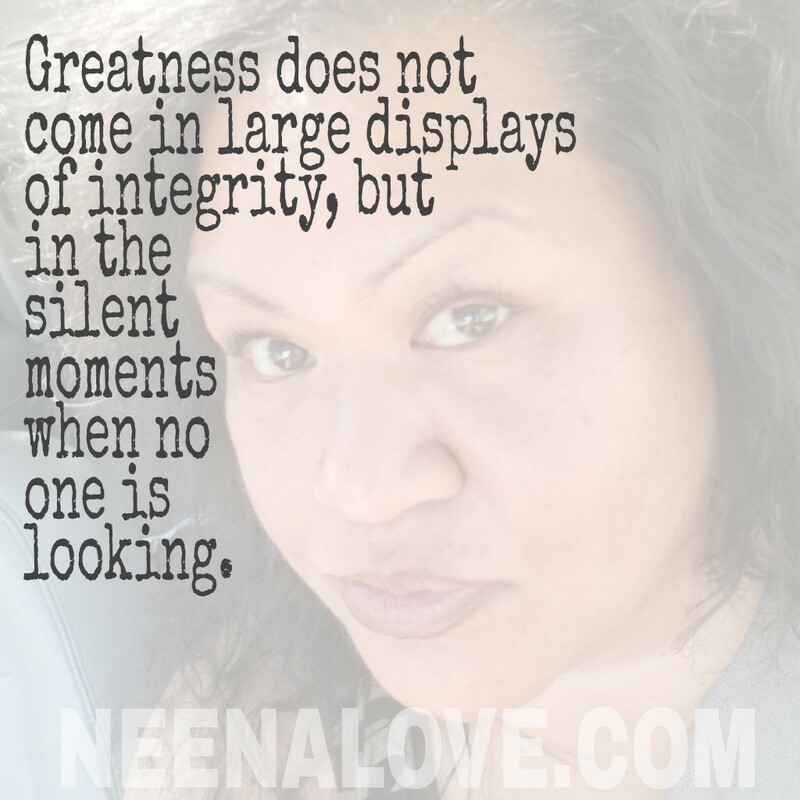 Greatness does not necessarily mean you need to be approved of by the world. 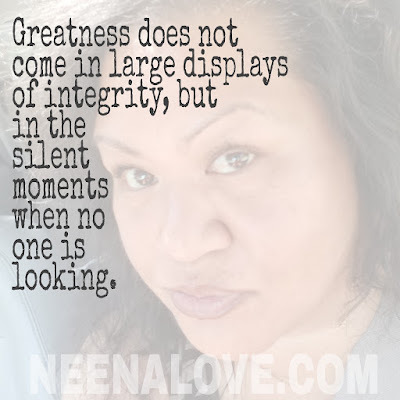 Greatness does not come in large displays of integrity, but in the silent moments when no one is looking. Greatness begins by living a courageous life, by doing good things, by being kind and compassionate, by keeping committments and promises; by making and keeping sacred covenants with God and self. Greatness is, at its core, a continuous expression of gratitude to the living Creator. If there is love inside your heart, give it away every day! The only real and enduring peace comes from believing in love and giving it away at every opportunity. Many times in life, we expect to be on the receiving end of love and yet give nothing to the universe to deserve it. Love yourself. Love everything around you. This, above all, is the greatest gift you could give to a supreme creator -- to love all of his creations as he would! Remember that inside of you is a goddess in embryo. And that goddess is made of compassion and unconditional love NOT judgement. She embraces you with every heartache you experience. So stop living so much in your head and allow the goddess inside of you to love you back to perfection.